We’ve been in the garage for far too long. As Jorgen Hahn can attest (he’s the one covered in grease,) much work has been going on out of the public eye. Liquid Minded is alive and thriving. The devil is in the programatic details and, as mentioned before, achieving something simple requires great effort. The hardest thing to design is simplicity, and we want Liquid Minded to be usable by kids of all ages. At one time, we were very close to beta. While we had nailed the features we set out to include, they were slow, and definitely not intuitive. We knew we needed to go back to the drawing board, which leads us to the current day: we’re on the cusp of alpha testing our new build and things are looking good. 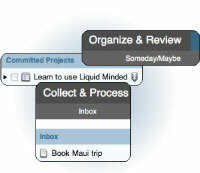 Liquid Minded is turning into a lean, mean, GTD machine. GTD is about excising a lot of information from your head and allowing you to compartmentalize it easily into contexts and hard landscapes. Since development is on a course all of its own, Jeff and I have made a lot of headway into how we want to market the product online. We learned some amazing things from some unlikely sources, and are quite excited about the future of our little company. Change is afoot at Nuance Labs. Without spoiling the surprise, I can say this: For everyone who’s been asking, we have a solution on the way just for you. Nuance Labs is entering the consulting business… just wait until you see how we do it.